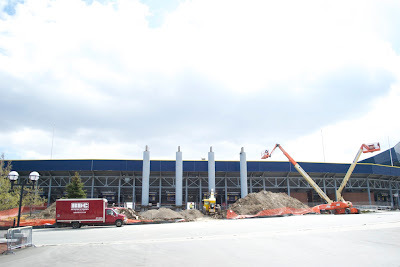 I was in AA today for the media practice session, and while in town I snapped a few photos of the football scoreboard demolition/construction. As you can see, not a whole lot going on other than there are currently no scoreboard where there used to be scoreboard. Right about the same time I was snapping these photos, UM media relations was busy releasing the first renderings and specs of the scoreboards that will replace the old ones at Michigan Stadium, Crisler Arena and Yost Ice Arena. 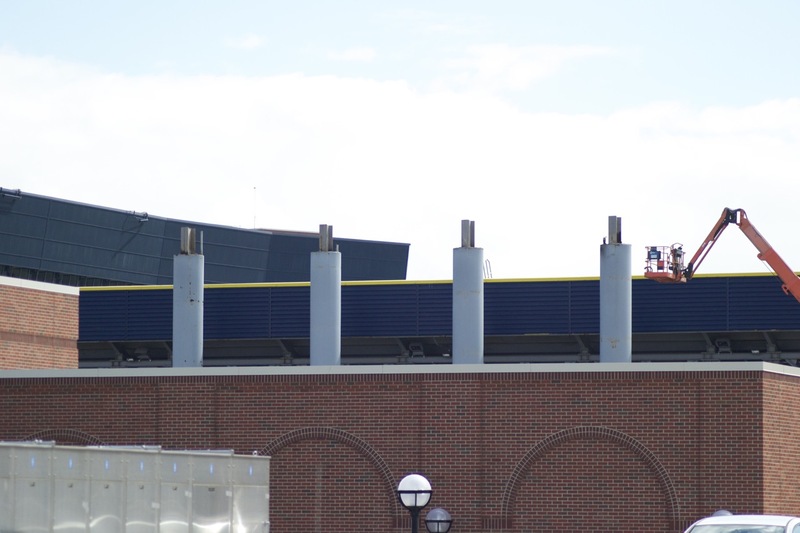 ANN ARBOR, Mich. – The University of Michigan Athletic Department announced that they have partnered with TS Sports/Lighthouse on a New Scoreboard Replacement Project. TS Sports/Lighthouse will be providing new state-of-the-art video displays and scoring systems at Michigan Stadium, Crisler Arena and Yost Ice Arena. TS Sports/Lighthouse is a leading LED video board company that specializes in video displays, scoring systems, installation and long-term service. Their turn-key visual solutions are created for a variety of applications including outdoor stadiums, indoor arenas, collegiate facilities and professional venues. TS Sports/Lighthouse recently installed video display systems at American Airlines Center, home of the NBA’s Dallas Mavericks and the NHL’s Dallas Stars. The Bradley Center home of the Milwaukee Bucks also recently chose TS Sports for their system. On the college front, TS Sports has recently completed projects at the University of Oregon, University of Connecticut and Ohio State University. 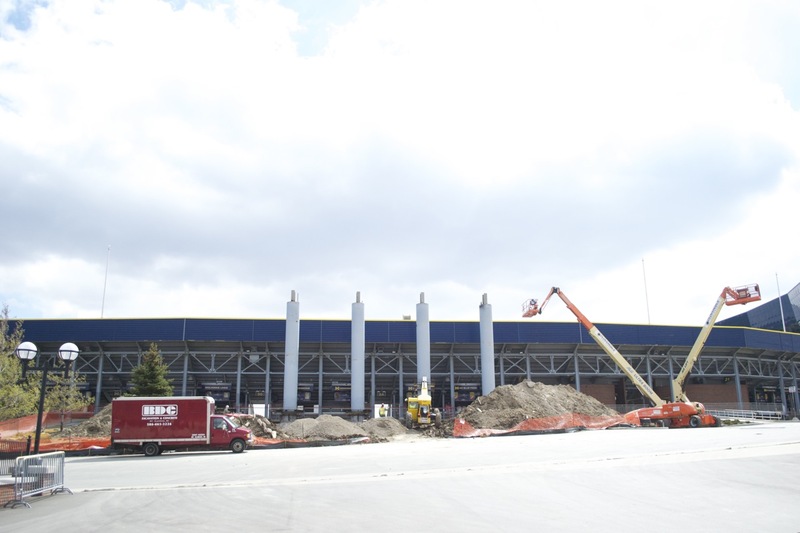 The demolition and removal of the existing video boards began in March. Over the next several months, TS Sports will install new state-of-the-art LED screens in both end zones of Michigan Stadium, which will be 40 percent larger than the previous system. The new video screens will be 47’ (h) x 85’ (w) and be located in the end zones. 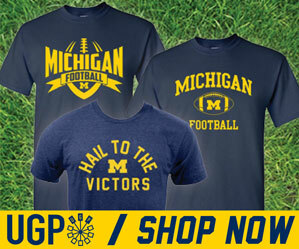 The Big House upgrade will be completed in August prior to the 2011 season. 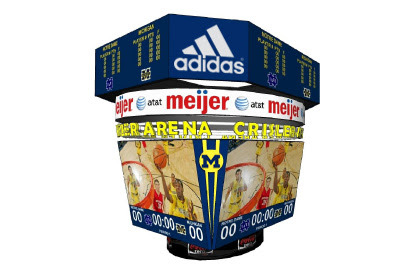 In conjunction with Phase I of the Crisler Arena renovations, TS Sports will replace the current center-hung scoreboard which was installed in 1998. 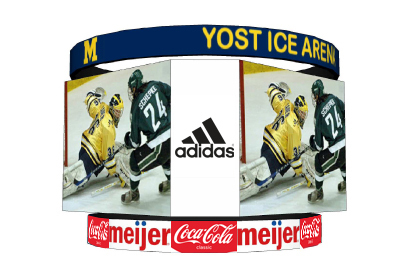 For the first time in its history Yost Ice Arena will get a facelift that will include LED video displays for the arena. TS Sports, based in Dallas, Texas, is an electronic video board supplier that provides state-of-the art light-emitting diode (LED) technology. 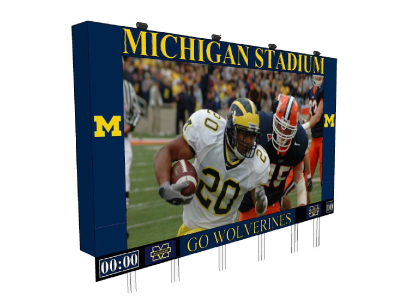 Founded in 1997, TS Sport’s innovative video boards are of the highest quality in the industry, and prides itself on being a unique, “one-stop shop” for its customers. In addition to LED video boards, TS Sports also installs and services scoreboards, advertising panels, electronic message centers, sound systems, control rooms, and advertising and naming rights. The company works with clients on projects from start to finish beginning with the design stage, then production and finally installation. Post installation, TS Sports offers the best service and response times in the industry. For more information about TS Sports, please visit www.ts-sports.com. As you can see, video...BIG video, is going to play a large part in all 3 venues once these puppies are installed. I was really hoping the Big House boards would be mostly a video board...and UM did not disappoint.